If you are looking for ideas for dinner, this recipe right here is sure to please when it comes time to get the job done. These Manuka honey glazed turkey legs know how to bring a little holiday flavor to your home, and your friends and relatives will learn real fast to be jealous of your cooking abilities after just one bite. To successfully make these delicious turkey legs, you will have to roast the drumsticks twice, and at each instance, you’ll upgrade the savory turkey using olive oil as well as various herbs that blend together seamlessly. These ingredients, and of course the buttery, Manuka honey glaze that gives this recipe its name, are set to make all the difference in your dish—and your guests aren’t going to know what to do with themselves. 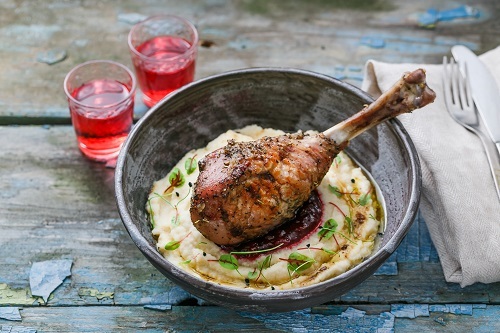 If you think you’re ready to take on the (easy) challenge of making this dish, then let’s get started on those Manuka honey glazed turkey legs! To begin, allow your drumsticks time to thaw in some hot water before preheating your oven to 350 degrees Fahrenheit. Place your drumsticks on a clean, dry work surface, perhaps a cutting board or a countertop. Coat the drumsticks with olive oil, using between one and two teaspoons for each piece. Season them with pepper, salt, and thyme before rubbing in. Move the drumsticks to a fairly spacious baking pan before drizzling them with the rest of your olive oil. Roast the drumsticks uncovered for about two hours. In a small bowl, add the melted butter, the Manuka honey, the soy sauce, the sage, the basil, and the rosemary, mixing them well until you get an even consistency. Coat your now roasted drumsticks using the honey-herb mixture. Use aluminum foil to cover your baking pan before returning it to your oven, roasting on the same temperature for another 15 minutes. Per Serving: You should have 561 calories; 37 grams of fat; 22 grams of carbohydrates; and 35 grams of protein. There should be a total of four servings. Need to order some Manuka honey to make this delicious recipe? To get your order started, click here. And, remember, we offer FREE shipping on all orders of $150 or more! Natural Hangover RemediesDoes Cannabis Help Honey Bees De-Stress?